As I have stretched my adventure with fish a tiny bit longer, I have started enjoying salmon. Being born in a state where fish is synonymous to life, one would expect that I would relish any seafood offered to me. Unfortunately, that has not been the case. As much as I yearn for a good fish curry, I have only few fishes to choose from. They are hard to get here and the list belongs to my home, the fresh water fish that I loved. I never could eat a “sea fish”. They smelled “fishy”, if you know what I mean. What we had everyday for our meals were fishes found in rivers and ponds. We even had a little pond of our own behind our house, teeming with fishes. The southern edges of my state is laced by the ocean, but we “Bongs” like to savor the river fishes…Fishes that are fresh and brought to our door step early in the morning by those who lay their nets before dawn and then pedal their way to every home with silvery glistening fishes in the baskets. Or they are found in the fish market, only a few minutes walk away from home. I used to visit the fish market quite often my grandmother, with bags tucked under our arms, holding hands and looking forward to our find on that day. After all these years, the sweet taste of fish from home still lingers in my tongue. I want to go back to those days when rich nigella flavored sauce stained the white steaming rice. Or the lightly tempered “Macher Jhol” – the light soupy fish stew with loads of vegetables fill up to the brim of the plate; some white rice and a good squeeze of lemon and it is called the most satisfying meal ever. I have got used to fetching river fish from the freezer chest of a Bangladeshi store. I have probably lost the finesse of distinguishing the taste of a fish delivered within a few minutes of being netted and a fish packaged and frozen for months. I am just happy that I get what I want – at least some of it. 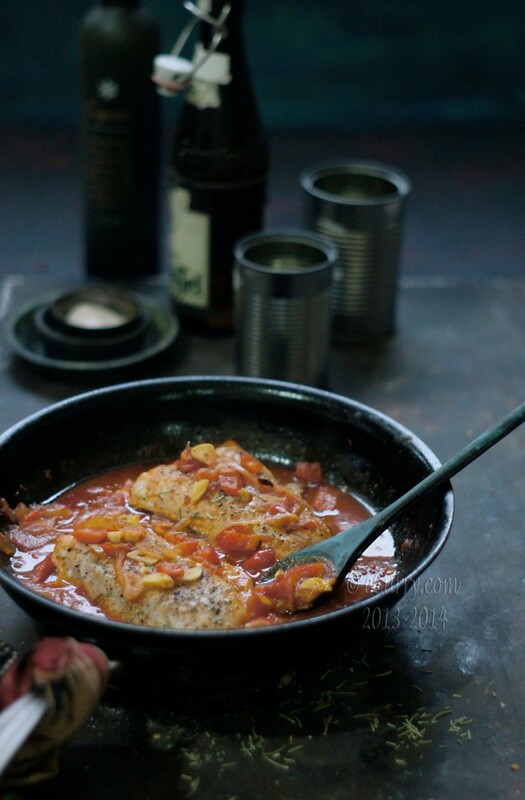 Only after so many years of cooking tilapia (which tastes nothing like the ones back home), catfish and hunting through piles in the freezer chest, I dared myself to try salmon. More for health than to break the boredom. I am glad I did take a step forward. I love it now. Drizzle lemon juice over salmon steak; toss it with freshly ground pepper and salt and allow to sit for about 10-15 minutes. Broil the steaks in the oven for about 6-10 minutes or until almost cooked through. Of if you want to cook the fish in the pan; heat some oil in a thick bottom (cast iron is good) pan and cook/sear the salmon until almost done and slightly browned. As the fish cooks, in a pan, add about 1/2 tablespoon of garlic and crushed pepper along with the oil and allow the oil to heat up. When the pepper sizzles and garlic turns golden add the onion and bell pepper (if you are using) and cook at low-medium heat, until the onions soften – about 5 minutes. Now add the butter and toss the onions; add the grated tomato and cook until oil/butter starts to separate and the tomato is cooked though. Stir occasionally. When the tomatoes are cooked through, add the rest of the sliced garlic, and the wine. Allow it to simmer at low heat for 25 more minutes. Adjust salt. Transfer the fish steaks and herbs to the pan, cover and simmer for about 3-5 minutes more or until you have the desired consistency of sauce. If you wish to, you may break up the salmon in pieces. Garnish with more herbs and serve over pasta, or flat bread or any crusty good bread. 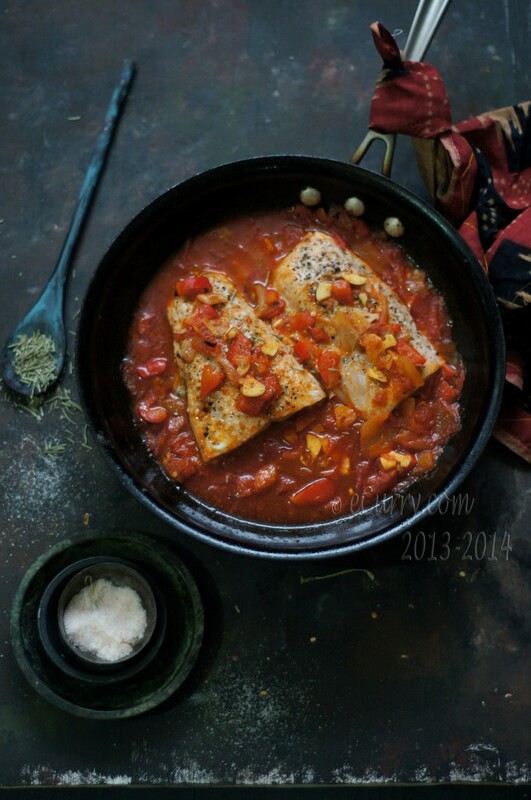 A flavorful and refined dish! I love everything about it. I made salmon with onion and ginger paste. It turned out pretty well. Though, the taste from fish from back home something I always crave for. 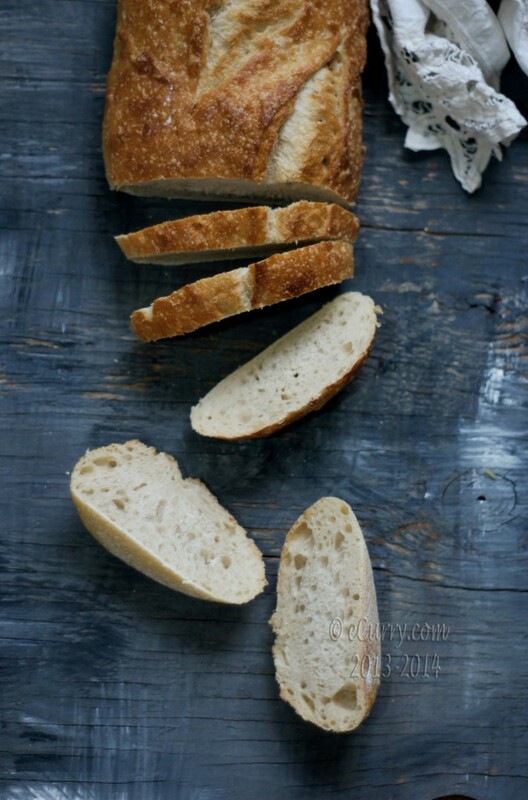 This seems to be easy and tasty recipe, will try it out sometime. 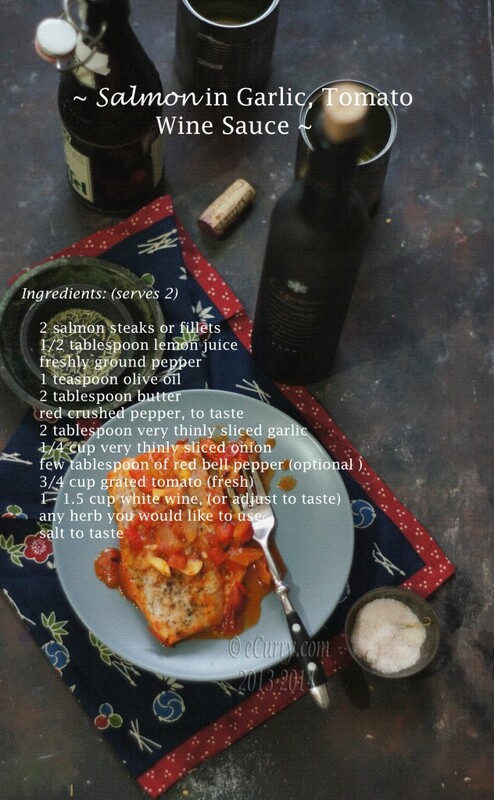 Love the flavor combo and the pictures…I have never tried wine with fish…Bookmarking this recipe – thanks !! 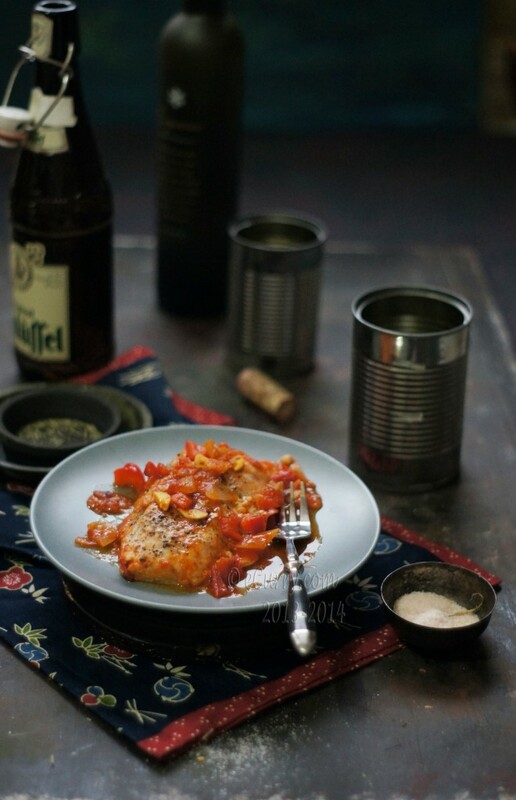 I think I will make this tonight with cod fillet! I too miss eating our authentic bengali fish curry. Tangra machel jhol, maach tok .. iissh mukhe jol aashe gelo! How exactly do you grate a tomato? I have never heard of that. Seems to me it would be messy, no? Simple and comforting meal for weeknights! Those flavors paired with salmon are just perfect. Excellent recipe. I made this tonight and even, for the first time, grated a tomato. It was a wonderful dish. I really enjoyed it and there is enough for leftovers. Thank you so much! I hope grating the tomatoes was not that difficult or messy! Ah, how interesting. I would thought you would be able to get more river and freshwater fish in your state than out here in CA – I think all the fish here is from the ocean. The dish looks wonderful, very flavorful I am sure. I recently came across your site. All I gotta say is an insane amount] of information. Would you be willing to swap links? Had this for dinner tonight. I wasn’t too sure about tomato sauce and white wine s I usually use a red wine for a tomato sauce.. but wow! Really yummy!! I had it with spaghetti but was wishing I had some crusty bread instead. Would’ve been perfect with that.